The Parts Department at Shawmut Equipment is one of the best in the nation, and Shawmut's team of Parts Sales Representatives have the talent, knowledge, and experience to get customers the right spare parts quickly. Shawmut Equipment stocks a large inventory parts in all three of its facilities, including Connecticut, Massachusetts, and New Brunswick, with an additional parts warehouse in St. John's, Newfoundland. Within their extensive inventories, Shawmut Equipment stocks spare parts for all of its products, including Grove Mobile Hydraulic Cranes, Manitowoc Crawler Cranes, National Boom Trucks, Potain Self Erecting Cranes and Utility Equipment. Shawmut has everything you need to get your machines back up and running on the jobsite quickly. Inventory is closely managed to maintain high fill rates for our customers, so parts are received right when they’re needed. If we do not have it in stock, we can get it, and our reputation depends on our ability to get it quickly. 99% of all orders are filled within 24 hours. 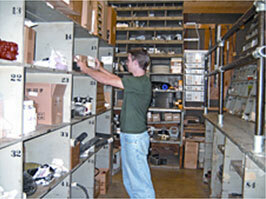 We can also help you with your parts needs for older machines. Rebuilt and used parts are regularly available as are parts for routine maintenance. You may contact our Part’s Department at (800) 829-4161 or request a Parts Quote online and one of our representatives will be in contact shortly.